Sadly, the story about how Bob the Millionaire Became a pirate is still highly relevant. And not long ago Mark Pilgrim had an article out that describes a couple of lessons that the professional part of the industry could learn from the pirates. Well worth a read. If you have two shops down the street. One sell illegal copies of movies and one sell legal originals. The shop with the illegal copies work like this: you go inside, find what you want, have a look at it, pay and go home. At home you play the movie on whatever equipment you want. The shop with the legal originals work like this: you need to pass five security checkpoints before you can enter. You need to register with credit card and all kinds of data before you can buy. If you’re citizen of the wrong country you get thrown out. If you have the wrong media player you get thrown out. If you have the wrong operating system you get thrown out. You can’t have a look at the product before you buy. The product you buy is infected with huge amounts of commercials for other products and annoying videos telling you that piracy is a crime (yes, only the people that actually pay for their products get the “piracy is a crime”-propaganda). …what shop would you choose? Don’t get me wrong. 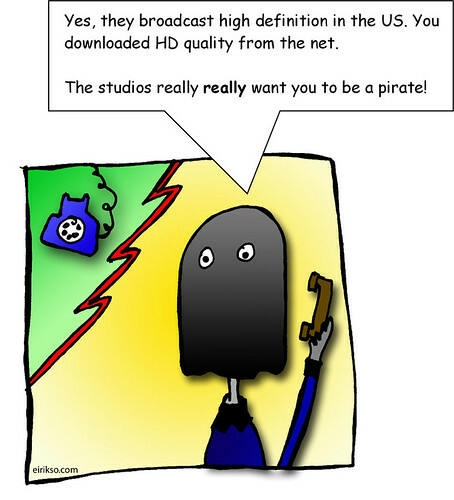 I don’t think piracy is OK. I am working within the content production industry. I know that it cost money to make high quality content. I think content producers should have the rights to earn money from what they make. The problem is that currently most of them have a very, very wrong idea of how to get paid and how to treat their customers.